I have already written about Teekyuu 7 (in Backlog: Week 2) and Teekyuu 3 Specials (in Backlog: Week 1). 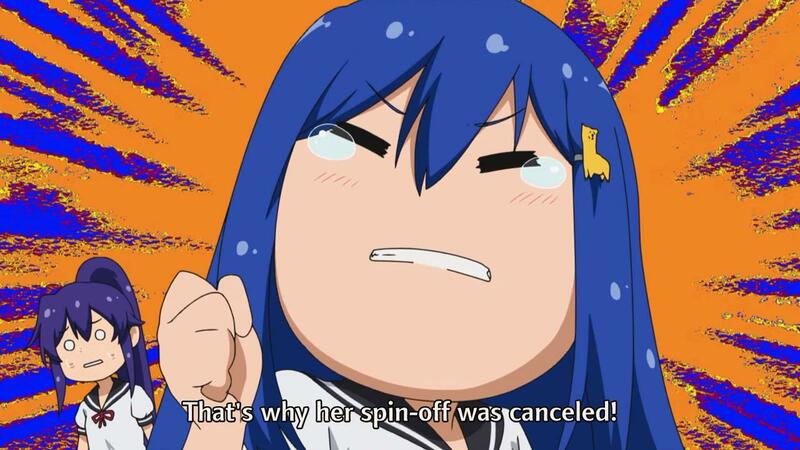 […]two-minute episodes of WTF, as per usual with Teekyuu. Those 54 characters sum it up very well. The series is supposedly about a high school tennis club, so one would expect tennis practice, tournaments et cetera. Instead in the first episode of this season we follow the alien, Tomarin, around for a day. It starts off innocent with house chores and √6, but fast melts into various gambling practices. This is not a kids’ anime. In episode 101 Yuri goes around reporting on other clubs. Among them is the Light Music Club. I think you can spot the reference. Other episodes include Nasuno’s birthday party, an idol episode (a very twisted one) and more. There is not much of a plot line. Teekyuu is a very character driven anime. There are four main characters. Marimo (blue hair with a lama pin) is sophomore, who does all kinds of crazy things, like eating underwear. Or running to school with it on her head. Aforementioned Yuri is the normal one and 突っ込み to Marimo’s (and Kanae’s) ボケ. She’s also the only one who knows how to play tennis. Kanae (pink hair) does crazy things as well, but, compared to Marimo, her antics are of a different level. She makes supernatural things happen—Yuri grows a beard for example. Last but not least, Nasuno is a rich お嬢様. She solves just about anything with money. 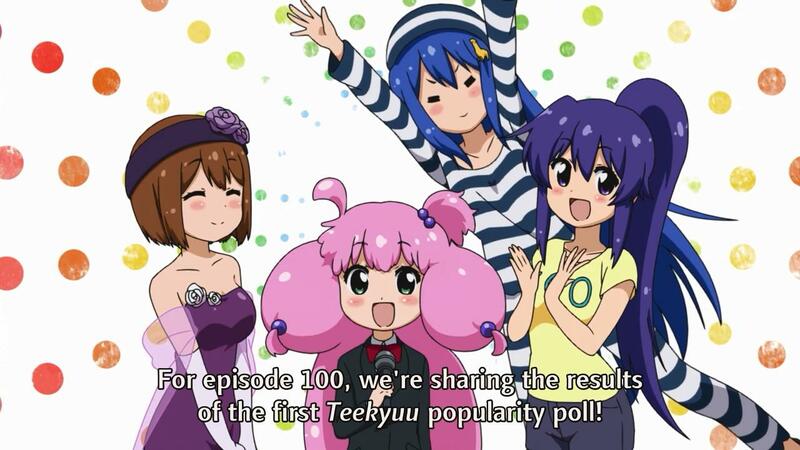 I always rate Teekyuu 4/10, but I keep watching it. When a show is this short, it’s easy to rationalize watching even if it is this stupid. I would say people watch it for the WTF factor. Breaking the fourth wall is pretty normal in Teekyuu.